The 3rd Air Support Operations Squadron trains, equips, and maintains mission-ready Air Liaison, Terminal Attack Control, and Weather Observation/Forecasting elements to support the commanders of US Army Alaska (USARAK), the 172d Stryker Brigade Combat Team (172 SBCT), with three subordinate Infantry Battalions and one Cavalry Squadron, the 1-501 Airborne Task Force, and the 4/123d Theater Aviation Battalion, deployed or in garrison at Fort Wainwright Army Installation, Alaska. The 3rd Air Support Operations Squadron (ASOS) was originally activated as the 3rd Direct Air Support Flight, on September 17, 1964 . It was tasked and aligned under the 18th Tactical Fighter (TAC) Wing at Kadena AB , Okinawa on October 8, 1964 , then deactivated on September 15, 1968 . Re-designated the 3rd Air Support Operations Center Flight, it was reactivated June 1, 1980 at Fort Richardson Army Installation (AIN), Alaska in direct support of the US Army Alaska and operationally aligned under Alaskan Air Command. 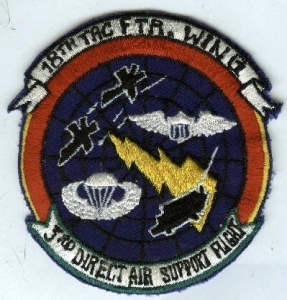 It was later task organized and aligned under 11th Tactical Air Command Group (and later Wing) on July 1, 1981 . Re-designated to its current name on Jan. 6, 1989 , the 3rd Air Support Operations Squadron relocated to Fort Wainwright AIN, Alaska on July 1, 1991 . The unit left behind a detachment at Fort Richardson to support infantry battalions south of the Alaska Range . The 3rd ASOS was tasked and organized under the 343rd Operations Group, Eielson AFB, Alaska on Jan. 27, 1992 , then again under the newly designated 354th Operations Group, Eielson AFB, Alaska on Aug. 20, 1993 . On July 1, 1994 , the 3rd ASOS was realigned under the 611th Air Operations Group at Elmendorf AFB, Alaska; however, the unit remained located at Ft Wainwright. At this time, the Fort Richardson detachment closed consolidating all manpower at Fort Wainwright. The 3rd ASOS was again realigned under the 354th Operations Group, Eielson AFB, Alaska on Feb. 14, 2003 where it currently resides. Numerous 3rd ASOS enlisted terminal attack controllers (ETACs) and weather personnel deployed, many in direct ground combat roles, in support of Operations IRAQI FREEDOM and ENDURING FREEDOM in Afghanistan , where military operations continue to this day. The 3rd ASOS “Arctic Grizzlies” primary missions now include tactical air command and control (TACC), terminal attack control (TAC) of close air support assets, theater airlift, weather support, and reconnaissance, fully supporting combatant commanders’ needs. The 3rd ASOS is home to the US Air Force’s only deep snow, arctic-capable Tactical Air Control Party (TACP) and Combat Weather Team (CWT), with several members who are airborne qualified. The squadron also trains several Battalion Air Liaison Officers from the 355th Fighter Squadron, Eielson AFB, Alaska who deploy, train and operate with assigned ground forces. I notice you have Tony Kristol listed with a couple of different DASF. He was also with the 22nd TASS in Hawaii and later with the 1st MOB in the PI. He was the first ROMAD that (was sent) into North Vietnam to provide communications for the POW release in 1973. Retired from USAF as MSgt then worked for either the State Dept. or Agency until 2nd retirement. Lives somewhere in Tenn. There are a few photos of him on the 1st MOB website along with newspaper articles showing him at Gia Lam Arpt in Hanoi and a story about him being the last ROMAD out of South Vietnam in 75. Quite a guy. 505th Tac Control Maint. Sq. Sgt Antonine A Kristol, Jr.
SSgt Watt, Ollie, He was our supply guy.